I love my both chair! It's soft and elegant. I put it in my dining room to give it a nice restaurant vibe. It looks gorgeous. It was also quick and easy to assemble. Very happy with my purchase. This high back loveseat is a great way to add something fresh to your home. With a buttoned, tufted back and seat, and winged sides, this loveseat hits all the traditional notes while still being fresh and new. 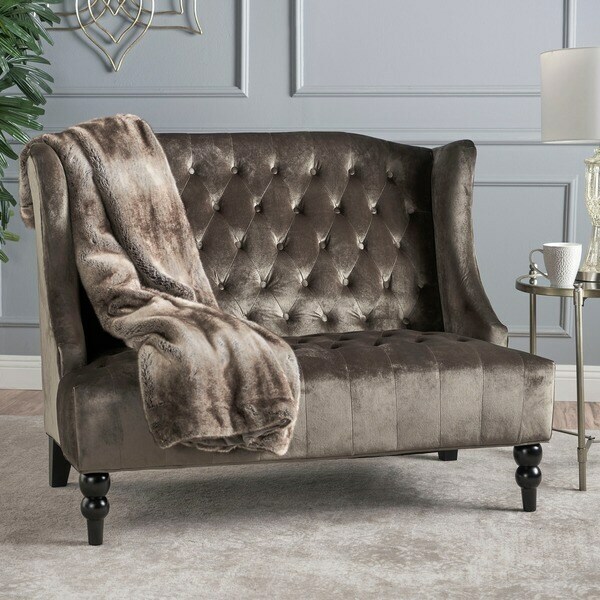 With extra plush seating, this loveseat is sure to be a hit in whatever room you decide to place it in. First time purchasing a Settee - more a settee than a loveseat. It does seat two comfortably. Like how tall the back is to lean. We wanted more sitting in small living room but if we had a large master bedroom this would probably be great there or in large foyer or window space. 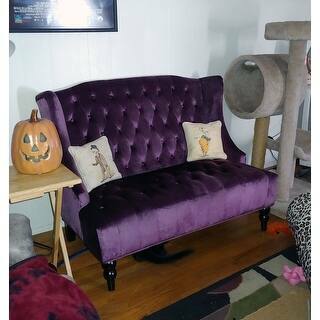 The purple color was true as shown and the velvet fabric is nice. Hopefully my cats won't pull on the buttons! The backside is very nice and can be placed where visible. It was a little more challenging to assemble than chairs of same designer we also purchased. Husband is handy and was able to get bolts lined up and secure - you do need a couple people. No wobble and sits straight and feels sturdy enough. Nice quality for the price. 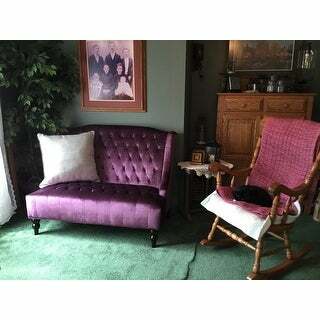 Absolutely beautiful loveseat!! I purchased the blue velvet. It goes great with my shabby chic, with a hint of Alice in Wonderland theme, room decor. It was delivered very fast! It came sooner than expected. And it was safely packaged as well. Also, the loveseat is very comfortable and the fabric is of great quality; it feels very smooth to the touch. Two adults sit comfortably with a little space between them, maybe half a foot. Overall, the loveseat adds class and elegance to any room. I bought this loveseat in emerald and it is very pretty and elegant. 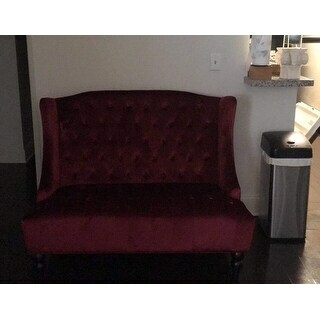 The loveseat sits very firm compared to my other velvet tufted furniture. It was easy to put together and looks great in the living room. The Leora Wingback Tufted Velvet Loveseat by Christopher Knight was a little challenging for me to put together. My daughter assisted and all went well. Delivered by FedEx it was also hard for one person to remove from the box. Once assembled, it is a lovely piece of furniture. Fabric is good quality and no defects were found. It is exactly as pictured. It coordinates very well with the other Christopher Knight pieces I purchased (chair and ottoman). What A BEAUTY! This love seat is function and gorgeous! I love the quality of the fabric and how well it goes with everything. The tufted buttons add such a grand look! Love it! Beautiful and soft velvet. If you want something with more of a plush, cushiony feeling when you sit, you may find this too firm. Fairly easy to assemble, minus the back two bolts that go into the seat to connect it to the back. The bottom of the seat makes it hard to use the Allen wrench there. Fast shipping!! Very good price love the color the price everything about it ! I was looking for something like this and founded in overstock they always have good prices and sales and coupons that you not going to find somewhere else! This is my favorite place to buy from now and on ! But I purchased the gray it is not gray at all it more of a green tint color. It doesn't even kinda look gray. It is not sturdy at all. You will have to lean it against a wall. It's on the hard side which is expected. The quality isn't bad for the price. Was easily put together about 30m. I like it but the color and the fact that u have to lean it against a wall is a down fall for me. It may be more but I have only had a few days. I would not buy again only bc the color isn't what it states. Leaning against the isn't as a big deal for me then the color. I’m so pleased with this loveseat. I ordered purple and was worried that it might be a shade I didn’t like, but when it arrived and I opened the box I loved it! The color is darker than the picture shows. Everyone loves it! Beautiful! and comfortable, but it was a little hard to assemble but worth it! Looks very expensive for the price! I love this settee so much. My sister is going to order one also. She wanted mine, but I told her to get her own. It fits perfect in the small space in the guest bathroom. Absolutely love this product. Looks great and has old time charm. Exactly what we were looking for in a coffee table. And the price is charming too! This is a really great looking loveseat. It’s a little Lower than I anticipated but it still looks great in our dinning room. The color is amazing. Beautiful!!!!! The price is amazing for the quality you receive. Absolutely obssessed and everyone who comes in falls in love with them. Comfortable too. Omg! Shipping was so fast. Arrived in excellent condition no damages! Not hard to put together at all. This purple is so vibrant. Must bye this! Yes i would recommend. I love the soft color and smooth fabric. The height is perfect for my wall and table accents. The bold beautiful color is uniquely perfect for the style, easy access for sitting and rising. No sinking. "Is there a weight capacity on this?" We do not test for weight capacities but our recommendation is not more than 250 lbs. "When will the Chocolate+Brown be back in stock?" "Will the teal color be sold again?" "How tall are the legs?" The legs are approximately 7 inches tall. "What color is Emerald-dark brown? it shown dark green in picture when select the emerald color option"
"Seeing an option for green in the pictures as I scroll through- will you be carrying the green as well?" There actually is not a green option. What you may be referring to is the 'grey' option (currently sold out). Under certain lighting situations it may appear to have a slightly olive (green) tone. "hello, the raisin appears to look more reddish wine, not a deeper tone like a true raisin. and the grey appears a dark taupe borwn. can you clarify if this is correct in the colour tones? thank you very much"
Yes, the red does not have a deep tone. The grey has shades of taupe.